Since the beginning of 2017, we have seen overseas department stores facing a number of challenges. Early last year, well known U.S. department stores J.C. Penney, Sears and Macy’s all announced plans to close hundreds of stores. On top of closures, Macy’s has been expanding their discount format in place of full price offerings, and J.C. Penny has been liquidating assets. Closer to home, Australian department store Myer also closed multiple locations last year after lower than expected sales. After such a tough year for what used to be the overseas heavyweights of the department store format, should our local equivalents be worried? In the past 12 months, spending at local department stores has dropped 1.8% compared to a year prior. Looking at just February, results remained in the red, as spending fell 1.5% on the same month last year. Transactions have stayed relatively unchanged over both periods, suggesting New Zealand department stores have also had to discount their prices in order to retain their customer base. The draw card of the traditional department store was the ability to stock up the home, refresh the family’s wardrobes, and fill the beauty bag, all under one roof. However as consumers increasingly value the ‘experiential’ aspect of retail, the multiple focus points of department stores may hinder these retailers from providing the personalised experience that their specialist competitors do. Key components of the traditional department store are typically cosmetics, homeware, appliances and apparel. Specialised competitors of these categories have been seeing strong growth from local consumers. Cosmetic retailers have had a bumper year, experiencing spending growth of 9.4% in the last 12 months, while transactions grew 9.8% over the same period (including online sales). Appliances, another key department store offering, have also experienced a strong year of sales. These retailers have seen spending increase 3.7% in the past 12 months, and 15.5% in February alone, well in excess of department store sales. We have also seen hardware and homeware experience positive results over the last 12 months (+4.0%), the latter of which is a common department store category. 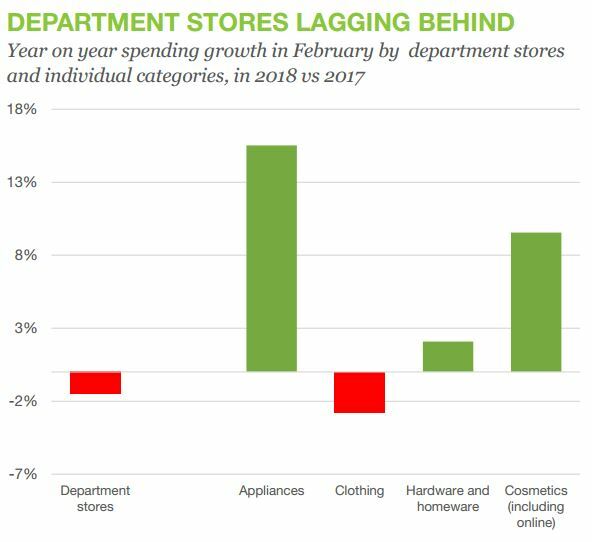 Clothing retailing may be one of the few department store categories that has experienced even slower spending results than department stores themselves, down 2.3% in the last 12 months. However as an increasingly popular and accessible choice for online shopping, this may be the cause for decline in this sector, as well as partially for the slump in department store sales. So why, if almost all department store categories are growing individually, are they failing when grouped under one roof? The changing demands of consumers and their expectations for retail may be partly to blame. Consumers are constantly at a paradigm of price and quality. Sales and low prices will always attract bargain loving consumers, but when the purchase calls for quality and a higher price tag (say a new piece of tech for the house, or internationally coveted makeup), we demand a uniquely personal in store experience, to not only understand what we are purchasing, but to justify the higher price. With their diverse offering, department stores are constantly challenged to meet both of these demands at once. When many have a wide range of luxury, high priced goods, but an in-store experience that must cater to every department they offer, the challenge is made even harder. What once used to be the draw of department stores – everything under one roof – is now eclipsed by online, essentially a giant department store. Online retailers offer an even wider variety of products than local department stores at lower prices, making many of our local store’s promotions and sales somewhat redundant. We are now starting to see local department stores change their offering to compete with lower priced online retailers, and specialised in-store competitors. Farmers has recently added high end cosmetic brands Kiehl’s and Mac to their offering. 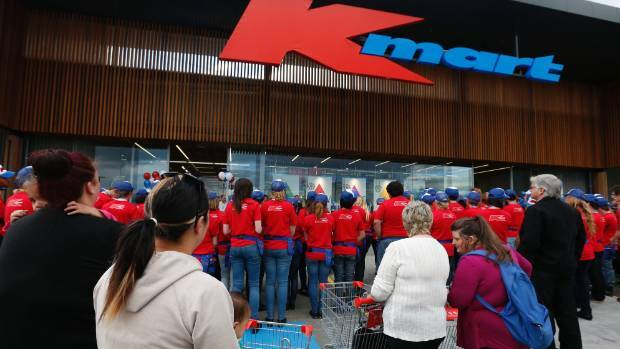 Kmart has chosen to compete on consistently low prices, a tactic that has caused rival The Warehouse to follow suit. As local department stores continue to hone their offering to meet the changing demands of consumers, they will be hoping to turn around the slowing sales results in their category over the last 12 months.